IPL began on friday with a match between the Kolkata Knight riders and Bangalore Royal challengers. we all know the hype behind this tournament and everyone was waiting for the big opening to see how the teams square up. The match in itself was not that interesting as it was completely one sided affair. The RC (Royal Challengers) were beaten by one of the greatest innings seen on cricket field by any player on any format from Brendon Mcullum of Kolkata Knight Riders. Mcullum smashed every bowler from the Bangalore team to finish with the highest induvidual score in this format when he made 158 n.o of just 73 deliveries. The match was one sided as the team lead by Rahul Dravid collapsed to make just 82 and losing the game by 140 runs. I was lucky enough to watch all the games this weekend and also all the teams in action. 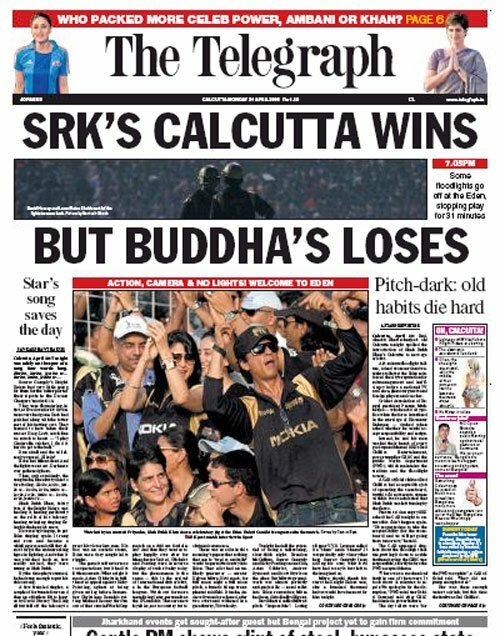 My first impression was that Kolkata team owned by Sharukh Khan seems to be the team to beat. They have the right balance with the right mix of youth and experiance. The Knight Riders have played two and won two. The other team which was very impressive was the Chennai Super kings lead by Dhoni. The Super Kings scored 240 in 20 overs riding on another great century in two days this time by an Australian Micheal Hussey. Hussey made 116 n.o of just 54 deliveries ably assisted by Hayden, Raina and Badrinath. The Super Kings have an excellent batting lineup but barring Murali they have a very week and inexprerianced bowling lineup. The next team which impressed me was the Delhi Daredevils lead by Virender Sehwag. The team has a very good bowling attack lead by the great Glenn Mcgrath who looked like he had been bowling all the while. The batting lead by the captain himself looks impressive too. The Bangalore RC who had a forgettable first outing came back strongly to defeat the Mumbai Champs lead by Bajji in the absence of Sachin. The RC team which I thought as the weak link in this tournament actually look strong in the presence of experianced Chandrapaul, Kallis, Boucher along with the captain Dravid which came into play against the Mumbai team in a tense chase. The team also contains promising youngters like Virat Kohli who impressed one and all with his batting in the U-19 world cup. The Kings X1 lead by Yuvraj, looks a strong outfit too inspite of their loss to the chennai team. They have a good balance in team and their bowling lead by Brett Lee looks fine. As I am writing this article they are battling with the Rajathan Royals lead by Shane Warne. The Rajasthan Royals seem like the weakest in the championship with a weak bowling attack apart from the genius Shane Warne himself. Their batting too looked very weak against the Delhi Daredevils attack. The Deccan Chargers though were undone by a bad pitch in Eden gardens where both teams struggled to score runs freely. We can probably assess their strength and weeknesses in the coming games. All in all the tournament was an interesting watch with all teams to trying to find their feet in this format. We will probably know about the teams more as the tournament progresses in the coming week. Lets hope that the standards improve and we have more close games in the coming week.